Through a partnership with Mothers’ Milk Bank of Tennessee, Erlanger Baroness Hospital is now a milk depot serving Chattanooga and the surrounding region. 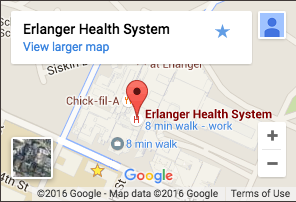 As a milk depot, Erlanger will serve as a safe, controlled collection point where women may donate their mother’s milk for premature and at risk infants in need. Our goal is to make it easy for moms to help other moms provide vitally important nutrients to their babies who are struggling to survive. What Is Human Milk Banking? A milk bank not only screens and tests its donors, but will also pasteurize and then test (culture) the milk prior to bottling for shipment. This allows donor milk to be safely given to preterm, hospitalized infants. Milk banks depend on "drop off" milk depots in order to meet the growing demand for donor human milk. The American Academy of Pediatrics recommends that pasteurized donor human milk be given to premature infants when a mother’s own milk cannot be used. Pasteurized donor human milk provides life-saving benefits to premature and at risk infants. There is a critical shortage of Donor Human Milk in the United States. If you’re interested in donating milk, the first step is to contact the Mother’s Milk Bank of Tennessee by visiting milkbanktn.org and clicking on “Donate Milk” to complete an entry questionnaire. For more information on the milk depot at Erlanger, please call 423-778-8304.